Protected: How Much Power do US Presidents Actually Have? September 20, 2010 by Adam	| Enter your password to view comments. Posted in: Politics	| Tagged: Bilderberg, Clinton, George W. Bush, Obama, Obama new George H.W. Bush? Auto Bailout A Responsible Use of Bailout Funds? The recent decision to use up some of the seven hundred billion dollars to help out the auto industry was in my view well thought out. However idealistic one may be about the free market one should be practical enough to realize that not bailing out the US auto industry would not only weaken the US economy as a whole but also weaken US industrial production strength. Many of the parts manufactures would go bankrupt as a result of a GM/ Chrysler failure, and that in turn would hurt raw material suppliers to the US. The US auto industry is crucial to the well being of the United States, because quite frankly a country of 300 billion isn’t going to get by with Google and Apple. We need manufacturing, and we need medium-paying jobs to sustain a middle-class. Now I realize that labor has for the past decade or more been outsourced to countries such as Mexico, India, and China for these jobs (in fact GM has plants in China and other parts of the world). This is not a bad thing, and in fact it is good for corporate profits. But by letting GM and Chrysler die, the US would be forfeiting an entire industry to foreigners. When I say die, I am referring to going bankrupt, and although some argue that allowing bankruptcy is the best option, I argue otherwise. In the case that GM goes bankrupt, for example, this would cause suppliers to change their billing agreements. Payments that could be put on credit for weeks or even months would now be required to be up-front. After all, the parts manufacturers can’t really trust a company that has no money, can they? Another result of a GM bankruptcy would be the inability for GM to finance their sold vehicles. As this is an economic downturn, few people have the option to buy a car strait-up without financing, so this would cause a cataclysmic circle of events that would end in economic tragedy. This bankruptcy, if it were to happen, would be the “Bankruptcies of Bankruptcies”, as no large a corporation has ever in the history of mankind gone bankrupt (the largest I can recall is United Airlines). Has it ever come to mind that even with the “bailout” GM would go bankrupt? Well, according to its financial trends this is certainly the case. A practical mind cannot stop and wonder what miracle would be required for GM, regardless of how much money presented to it, would not go bankrupt. A company that is leaking more than five million dollars a day is certainly not a company I would want to invest in, and quite honestly I would rather pay a little more and get a quality Toyota than risk my luck with another GM vehicle (personal experience). What if GM wastes all of the taxpayer money in a foolhardy attempt to reinvent itself? Of course only a fool repeats the same things over and over again and expects a different result, and so it would be if GM continued its same business practices and followed the same model; this is especially true in these financially challenging times. Right now, the world is shifting into “save” mode, and unless something drastic occurs, we are going to be in this sorry state of affairs for probably a year or more longer. The “Ripple Effect” is in effect, and the ripple has not reached the edge of the lake, sorry to say. So is the auto bailout a good thing, or is it a bad thing? I really don’t know, and I’m sure no one quite knows. Just like no one I know knew that this financial catastrophe would ever occur, and in the year 2008 of all years! A perfect solution to the problem just doesn’t seem visible. When one is faced with two tough decisions, and one doesn’t have the power to decide which will be decided, then one can feel secure knowing that he/she wasn’t the one responsible for the negative consequences of that choice. If you’ve read this entire article, then you certainly have some time on your hands, but thanks. We’ve seen it before. After 9/11 the Patriot Act was enacted, granting the President and other government entities unhindered access to tap in to your communication, research into your bank and library transactions, and also search your home without a warrant. In the same way today Bush and the gang of European leaders are dividing up our financial freedoms and the freedom of the free market in response to the morgage crisis caused initially by government interference. It is now time to wake up, and demand that lawmakers listen to the will of the people (which they did NOT do by passing the 850 billion dollar bailout plan). Bush has, in these last months in office, perhaps done more harm to America’s freedom than the other eight years together. 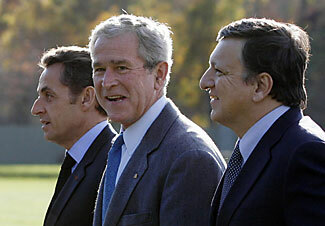 Only time will tell, but one thing is certain: We do NOT need a new financial order as dictated by Mr. Barroso to President Bush.